As many of you know, Amy’s daughter, Lo, just turned one in June, which makes Lo and the baby #2 only a short 17 months apart! While Amy is super excited to have babies that will be so close in age, they did have to make a few household adjustments. For starters, Lo’s room is still very much a nursery so they decided instead of creating another nursery, Lo would get an upgrade to a big girl room down the hall! 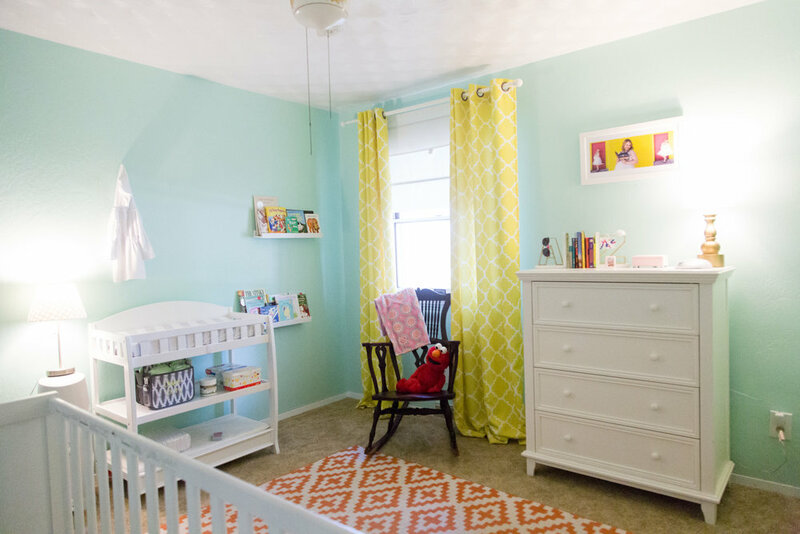 That room is still a work in progress and we can’t wait to show you all the girly adorableness Amy has chosen for her! In the mean time, we thought it would be fun to share pictures of the nursery! I love the fun, bright colors and all the sentimental pieces throughout the room like Amy’s maternity pictures, books and blankets from family members, etc. It’s such a sweet space for a baby! Another adjustment they made was creating what we have come to lovingly call “The Containment Zone”. Did we mention that Lo just started walking? Well, she’s definitely on the move now! Which means everything is no longer safe! You know how it goes, everything gets moved up a shelf or two, baby proof every room, etc…. With the new baby coming, Amy knew she needed a space that Lo could walk, run, climb and play to her hearts content, especially since it is going to be hard to chase her holding/nursing a crying or sleeping baby. The room once their formal dining or sitting area is now completely kiddo proof and adorable! She found the perfect little couch and rug and of course gates in all openings. And, of course I want to mention the sweet little table by the window - For pictures sake the chairs are next to the table, but in reality, let’s face it, those chairs are used as climbing assistance and will have to be stored across the room! The table was actually Lo’s Dad’s when he was little and her great-grandpa had it refinished for her first birthday! Isn’t that so sweet?!?! Of course ignore the empty wall space on either side of the TV - Lo has her own wall by the couch and the wall space on the other side is saved for when new baby arrives! We hope you enjoy a little sneak peek into their world! As for the rest of us….. I (Hillary) spent all day Sunday cleaning out what was once Sadie, our 2 year old’s room, in order to get it ready for baby #3! We have started combining Austen, our oldest and Sadie into one room. So, if any of you have suggestions on how to fit 2 girls insanely endless wardrobes into one regular closet, I’m all ears! The shoe collection alone has already been quite the challenge, haha! But, technically Sadie’s old room is now ready to be painted this coming weekend and the crib has come out of storage! If it didn’t feel real before, it sure does now! Alicia has been busy unpacking and organizing all the amazing gifts she got from her baby shower. She is just about ready to go! With only four weeks left it’s time to start thinking about things like packing her hospital bag, having her car cleaned, making sure to get in one last hair appointment for herself, etc! And of course, if you are one of her clients, be sure to book now - her calendar is crazy with clients trying to get in before Carson’s big debut! "Don't Drink The Water" - From Toddler Room to Nursery & More! "Don't Drink the Water" : Hillary & Amy's 10 Pieces of Advice for Alicia & Then Some!